This dreamy cottage in Springfield, Missouri was the first home of Brittany Kingery and her husband, Justin. Brittany blogs about their home makeover projects on her blog Britt Kingery. According to her style philosophy a home should tell a story, decorating should be affordable, and the design should be personal yet timeless. 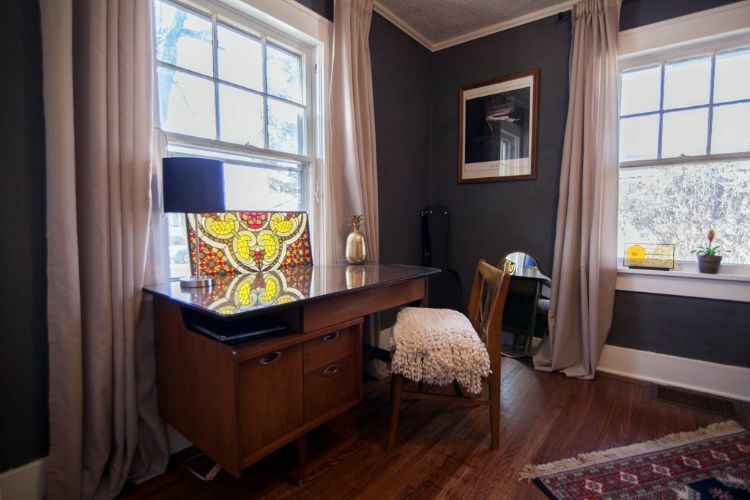 This sweet little bungalow encompasses every aspect of her philosophy from the bold paint colors to the unique vintage furniture in every room. Built in 1930 the house is full of historic charm. 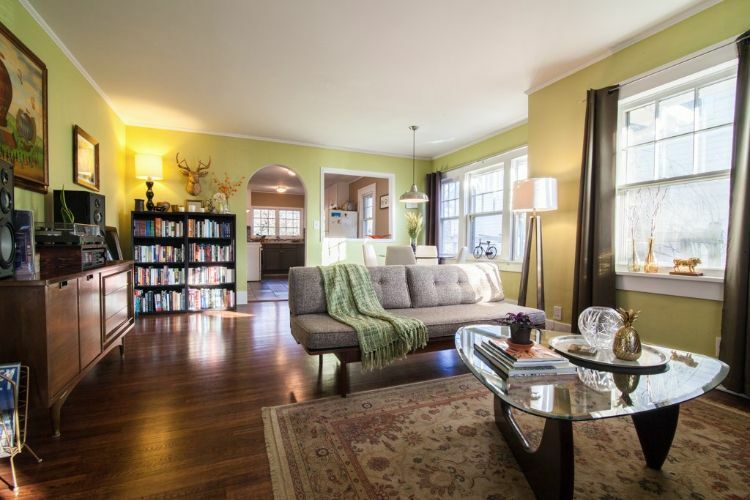 Take a full tour of each space in the photo tour below! 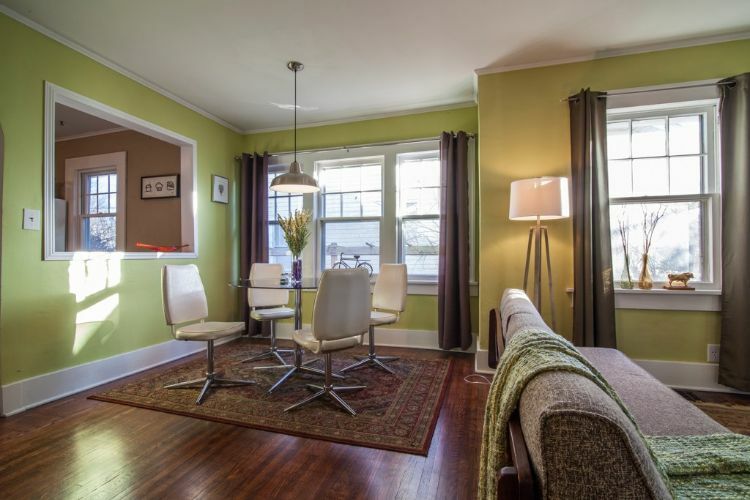 The living room features cheerful lime green walls and a beautiful selection of vintage pieces. Mid century modern is mixed with traditional, creating an eclectic and welcoming space. The dining space is tucked into a corner with an interior window connecting it to the kitchen. A metal farmhouse light fixture defines the space. The kitchen is petite but functional. 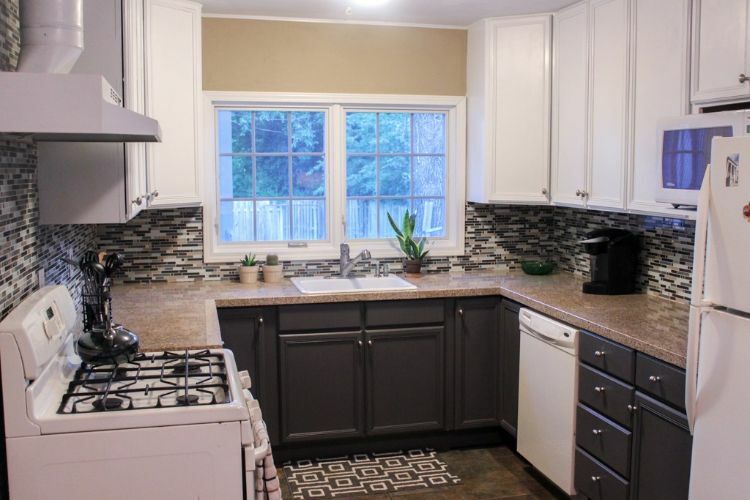 Gray lower cabinets are topped with a sandy colored granite counter top, while white upper cabinets lighten the space. A glass tile mosaic back splash ties all the colors together. 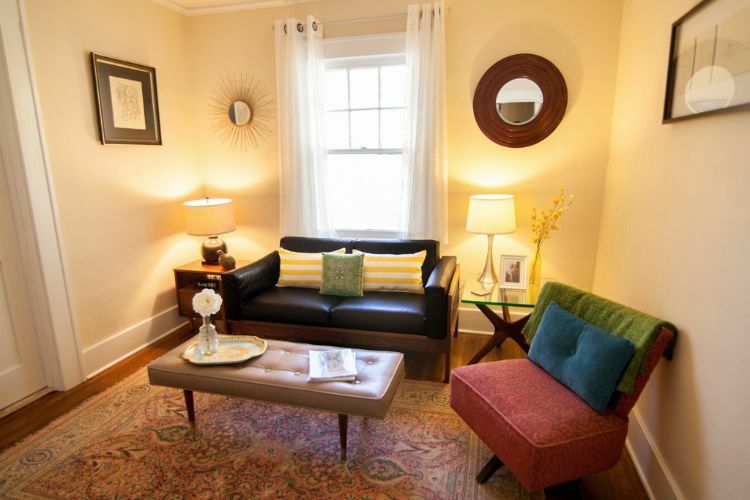 The cozy TV room features clean lined furniture and a soft Persian rug. Simple artwork and round mirror finish the look. You'll find moody gray walls in the office softened by flowing curtains. The thick white molding throughout the home adds character and architectural interest. Another bold paint choice is found in the teal bedroom. Warm wood furniture grounds the space, while a tribal style rug is the show stopper. 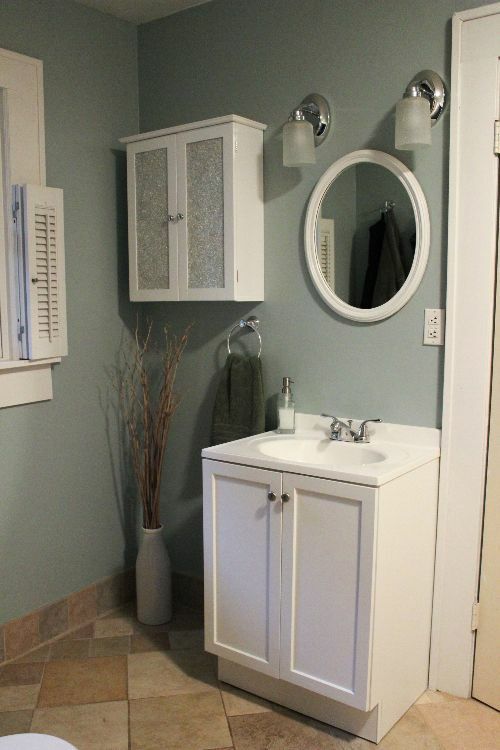 The bathroom is simple and classic with a white vanity and polished nickel fixtures. 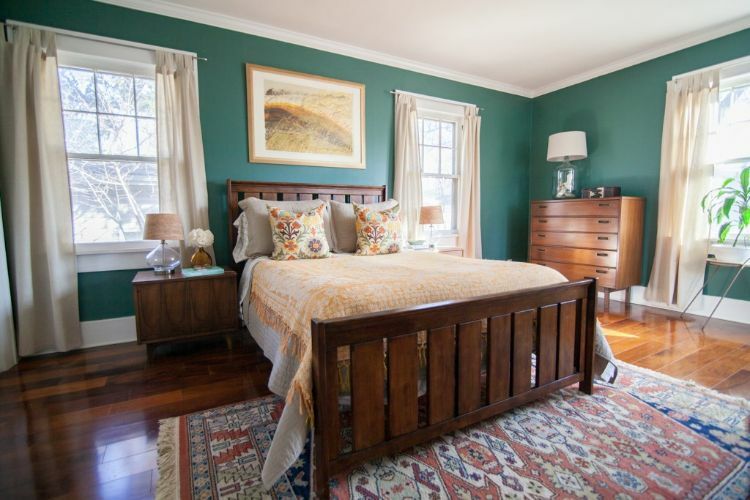 A greenish gray paint color creates a soothing spa-like atmosphere. 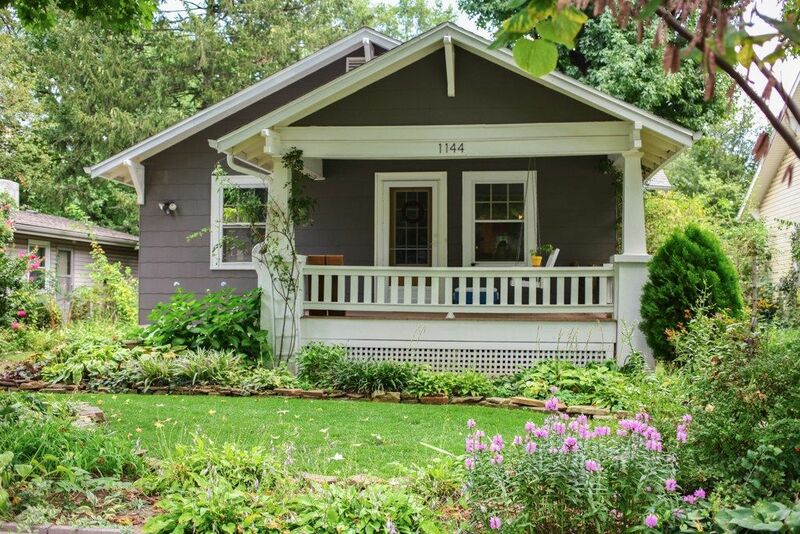 Can you picture yourself in this cozy and colorful bungalow? Be sure to save this cottage tour for future inspiration. You can share it with friends and family on Facebook, Instagram, or Pinterest!